Sanrio and GUND are proud to present Gudetama – a lazy egg and popular Japanese YouTube cartoon who isn't a big fan of doing anything at all. Ugh, Gudetama doesn't want to get up. This 3 3/4-inch lazy egg keychain won't abandon its bacon blanket. 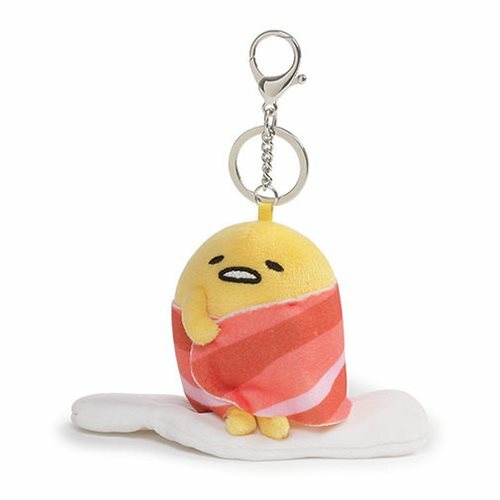 The Gudetama Bacon Wrap Plush Key Chain can be easily taken on-the-go with an attached secure metal clip and ring, although it really doesn't want to go anywhere. Measures about 5-incehs long x 3 3/4-inches tall x 3 1/2-inches wide. Ages 8 and up.